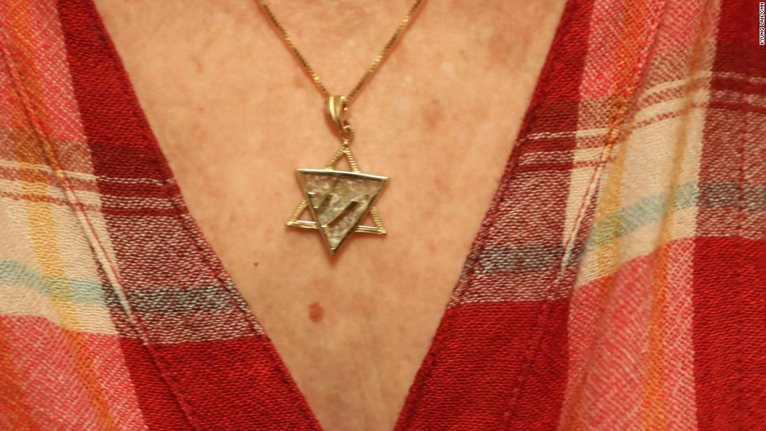 The woman wears a Star of David pendant. To her, the Holocaust is a permanent reminder that people could be kicked out of a country they thought was home. The apartment's beige walls are bare except for a cross in the dining room and one near the bedroom. No pictures of the inhabitants are anywhere. The simple furniture is sparse and relatively new. The mother and her two daughters who live here could disappear in minutes if needed. They're on the run from Immigration and Customs Enforcement. This apartment, empty of the family collections and clutter of a normal home, is their refuge. It is a safe house, though the unusual grouping that brought it together -- a Catholic Latino family, a Jewish woman and a Baptist minister -- know they could actually be raising their risk of getting in trouble with the government. The woman who is the cover. Sitting on a dining chair in the apartment, seemingly serene, is the woman who made this happen. She wears a gold Star of David pendant and earrings inscribed in Hebrew. One reads, "I am nothing but ashes." The other says, "The whole world was made for me." "The earrings remind me to take up the right amount of space in this world," says the Jewish woman. "Not too much, but not too little." In this little apartment, the Jewish woman is taking her space in the world and making her mark on a family with her defiance of US immigration policy. She signed the apartment lease and is the cover for the family who lives here, in a suburban California middle-class neighborhood, dotted with strip malls. Like the family she shelters, she asked for anonymity to avoid drawing the attention of the authorities. Her own home has "much privilege," she says plainly, and she, her husband and her children have the contentment of a life being well lived. She first heard about an interfaith network helping undocumented immigrants at her temple. A fellow congregant approached her about "a service opportunity." "We, as a temple, we talk about it's our job to go out and do good in the world, to help the other," she remembers. "Here was something put in our laps, a really concrete way to make the world a better place." The network began after the election of President Trump and the fears -- and then reality -- that undocumented immigrants would face stricter enforcement action. It's our responsibility. What was done to us cannot happen to other people. For the woman, the link from the present to the history of World War II is strong. "I grew up in the time where the Holocaust was not so far behind me," says the woman. "There was always that awareness, as a Jew, that it's possible to be kicked out of a country where people thought they were home. And many of those people didn't make it." She says there is a strong feeling in the Jewish community. "We cannot let this happen. It's our responsibility. What was done to us cannot happen to other people." So she took up the "service opportunity" and met a mother and her girls. "We can't talk to anyone. We can't tell anyone," says one of the daughters, a 17-year-old senior in high school. "Fear? You can't get rid of it. My mom's status isn't legal." Her sister is a year older but they're both seniors - one had a birthday late in the school year, the other, an early one. They were both born in the United States and until Donald Trump was elected President, the girls say, they felt like any middle-class family. The teenage girls enrolled in a new school after making the safe house their home. Their father had just bought a car. Their mother had just got new furniture for their rented house. They were planning where they'd be going to college. They knew they'd go; their parents had made that clear from when they were little. "It was about a year ago," says one of the girls. "It was a regular day. My dad dropped us off at school like usual." They wished him good luck, because on that day, he was heading to a residency appointment with ICE. An immigrant from Mexico, he was in the process of normalizing his status, having been undocumented for years. They weren't nervous, though, because he was on his way to fixing everything, they believed. It was a couple of months into the Trump administration and, despite trepidation, there were few examples of nonviolent, nonfelon offenders being deported. So the girls said farewell to their father, expecting he'd pick them up after school. They haven't seen him since. He was detained and deported that day, says his family, for entering the country illegally multiple times, decades ago. "We went home, packed all of our things, and we never went back," says the 18-year-old, tears rolling down her face. They left their father's new car and their mother's furniture behind. They grabbed a few changes of clothes. They left their home in under an hour and haven't returned. "ICE destroyed my home," their mother recalls. But she had little time to grieve the loss of her husband or her possessions. Also originally from Mexico, she had overstayed a tourist visa many years ago and had no legal documents. If she was next, who would care for her children? "Where would they live? Where would they go to school? Who would feed them?" You can't let them know what your fear is, because you don't know how others will react. She begged friends for couches. The three of them spent hours, day after day, in malls, trying to figure out where they could sleep next. The mother, who trained in culinary school, was feeding fast food meals to her daughters. "We became homeless for five months," says the older sister. "We moved schools. We went somewhere else because we had to leave the city. We were sleeping from house to house, anywhere we could find." The girls rapidly became experts at not just hiding from the authorities but masking their emotions. "I put a smile on my face every day," says the younger daughter. "But deep down, I'm hurt. I'm hurting. You can't let them know what your fear is, because you don't know how others will react." Two crosses on the wall are the sparse decorations in the apartment. Their mother turned to a church, the one place where she felt she could talk. Someone there told her about an organization out of Los Angeles, called LA Voice. The group was a part of PICO National Network, one of the largest community-based efforts in the country, representing 1 million families in 150 cities and 17 states. The mission of PICO and LA Voice is clear and simple: Help congregations turn faith into action. "I think we can stand on very solid scriptural ground and say no, this is not Christian behavior," says the Rev. Zachary Hoover, executive director of LA Voice, of the escalation of deportations under the Trump administration. "We are asked to love our neighbors as ourselves. Ripping children away from their parents under the pretense of community safety when these are our neighbors and churchgoers? No." He pauses and then repeats the word, "No." The Rev. Zachary Hoover says he is inspired by people taking a moral stand and backing it with action. Hoover, a youthful, slight, optimistic minister seems an unlikely organizer for a network directly sticking its thumb in the eye of the federal government on moral grounds. But then the ordained American Baptist minister, who is fluent in Spanish, begins to speak. "My particular call in the gospel is to be in partnership and stand beside people who are most attacked, who are most at risk, who are most suffering," he says. "It's been amazing and inspiring to see folks step up and take risks for both members of their own community as well as people they've never met before because they believe what's happening is wrong and they have a moral obligation to do something about it." Hoover helped organize a rapid response network of synagogues, mosques and churches. They can offer legal assistance, accompaniment to ICE check-ins, financial help, or in the case of the safe house network, direct sanctuary. There's a part of me sitting here talking to you, I think, gosh, should I be having this conversation. But the truth is, our folks are facing a much greater fear every day. He says more than 2,000 congregations have trained in rapid response across the country, most of them in California. The network of safe houses has, at any one time, dozens of undocumented immigrant families who are hiding from ICE. The goal, says Hoover, is merely to keep families together. By design, members of the network often don't know who is offering the help and who is being helped. Hoover keeps track generally by word of mouth from various congregants. And while he is certain he is following God's law, he knows he could be seen as violating man's law. "I'm not going to lie, that makes me very nervous," says Hoover. "There's a part of me sitting here talking to you, I think, gosh, should I be having this conversation. But the truth is, our folks are facing a much greater fear every day." In a statement, US Immigration and Customs Enforcement said, "Knowingly harboring an alien is a federal crime." ICE spokeswoman Sarah Rodriguez continued: "ICE does not exempt classes or categories of removable aliens from potential enforcement. All of those in violation of the immigration laws may be subject to immigration arrest, detention and, if found removable by final order, removal from the United States." While current ICE policy does not encourage enforcement at sensitive places like schools, hospitals and places of worship, Hoover's network of safe houses can also tap into the protections of the Fourth Amendment against unreasonable searches. At the apartment, one of the daughters shows the Jewish woman her financial aid package for a college where she's been accepted. The girls are continuing to make plans for the fall. The two mothers clasp hands in the apartment. "We're going to be someone in the future," says the younger sister. "We're going to show my parents that they raised two good daughters who are going to prove to them that we're going to be someone in life." The Jewish woman and the undocumented mother hold hands. It's striking how similar their hands are. "We're not going away," says the Jewish woman. "We're going to stand together. We're more unified than ever." RA: These judgmental hypocrites will get theirs in the end for God promises to spew them out of His mouth like "vomit." "Judge not" and "love thy neighbor" are principles these fakers just don't get.